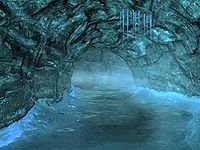 Sea Cave is a cave located in the Japhet's Folly area. The cave leads to the lower section of Japhet's Folly Towers. It is featured in the Rise in the East quest. 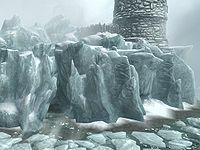 Its entrance is beneath the cliffs and reached by crossing the frozen sea (if it is difficult to see, check the local map). The entrance leads directly into the cave, which is used for bringing in provisions via rowboat. It is home to two mudcrabs. There are numerous crates, barrels and sacks of food throughout the cave, some of which have bottles of wine or alto wine on top. Against the west wall is an unlocked chest. A path leading up to a short passage is to the south. This leads into a second room with more crates, barrels and sacks and also a hole through a wall opposite into a fort. There is another mudcrab in this second room, and any noise will alert a Blood Horker guard that is standing beyond the hole in the wall, helpfully facing away from you unless alerted to your presence. Through the hole is a storeroom containing a large stack of unusable barrels, several crates and sacks containing food, and two sets of shelves holding seven bottles of Nord mead, a random potion of stamina, and a leveled potion of healing. Hanging from the ceiling from racks are four rabbits, three pheasants, three garlic braids, and four salmon. There is an unlocked chest against the rear wall and in the southwestern corner is a flight of stairs leading up to a wooden door that leads to Japhet's Folly. Japhet's Folly has many severe glitches. See the Japhet's Folly page for more details. Beware a glitch that occurs when returning to Japhet's Folly via Sea Cave after the bombardment has started. The door through which you come will now be disabled, preventing you from going back the way you came, but the top section of the tower is now barred by rubble, leaving you trapped in the bottom section. This page was last modified on 8 November 2014, at 00:25.